Fabulous frozen yoghurt and gorgeous granita make deliciously refreshing desserts. In a saucepan, bring the sugar and water to a boil, then simmer for 6-7 minutes or until syrupy. When totally cool, process in a blender with the blueberries until smooth. Press the mixture through a fine sieve to remove the seeds. Pour the yoghurt and vanilla extract into a large bowl. Drizzle over the blueberry and sugar mixture and gently fold it through with a skewer to create a soft swirl (don’t over-mix it). 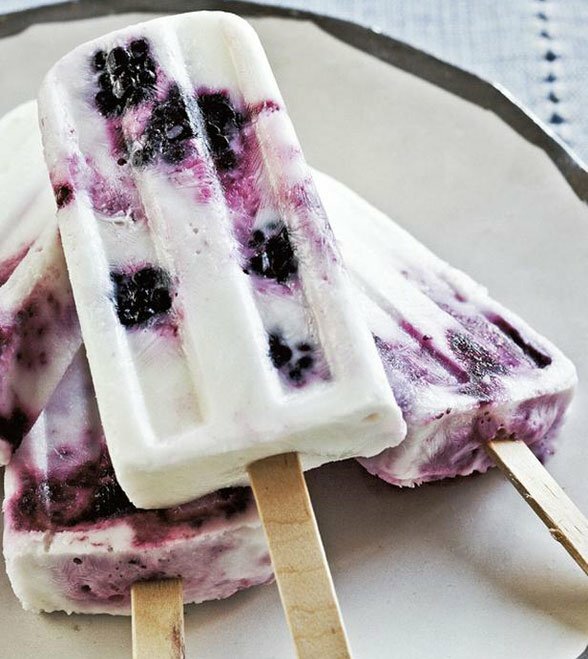 Spoon the mixture into ice-pop moulds, insert the sticks and freeze for 3-4 hours or until set. To remove the pops, dip the moulds in warm water for 10-12 seconds and gently release the pops.